Looking back over some pictures the other day, I came across my photographs of the garden at Rousham in Oxfordshire and in particular the image of the statue of the Dying Gaul, sometimes known as the Dying Gladiator. This reminded me that, years ago, I'd seen a pub in Brigg, Lincolnshire, called The Dying Gladiator, and I began to wonder whether the building and its remarkable sign were still there. They are. The sign, sculpted by William Clark in 1863, shows a moustachioed Gaulish warrior in his last minutes. The sign in Brigg is based on previous sculptures of the figure, which date back to a classical statue of a similar figure from about AD 230, now on display in the Capitoline Museum in Rome. This ancient marble statue shows a man who is collapsing on top of his shield, and is naked except for the torc around his neck, as some Gaulish and Celtic warriors were said to be when they went into battle, "trusting only in the protection that nature gives," as Diodorus Siculus says. The nakedness and torc mark out the statue in Rome as a warrior, but up to the middle of the 19th century, people thought he was a gladiator. Lord Byron saw him, and described him, "butcher'd to make a Roman holiday" in Childe Harold's Pilgrimage. The Roman statue was copied many times. Small copies were sold to travellers in the 18th and 19th centuries, those grand tourists who were on the lookout for artistic souvenirs to take back home. Bigwigs commissioned further copies for their gardens, like the one in the beautiful garden at Rousham that inspired these musings. Even Louis XIV had a copy. No doubt these owners of copies of the subject were remembering the strong carving of the sculpture in Rome; some were giving talented carver-copyists the chance to shine; all were appreciating the powerful emotions inherent in the subject – a man who faces death bravely, who "Consents to death, but conquers agony" as Lord Byron put it. Many would also admire the toughness of the Celt, the man from a small nation who stands up to the Roman war machine with nothing to protect him but his wits and his strength. Photograph by David Wright, used under Creative Commons Attribution-Share Alike 2.0 Generic licence. The photograph is from Wikimedia Commons and is dated 2008. I think the statue may have been cleaned and restored since then. 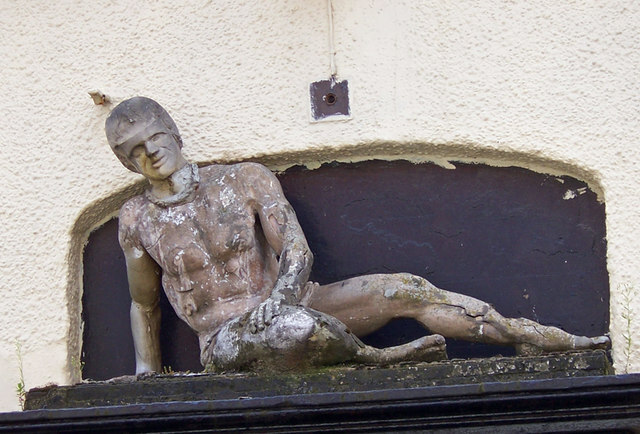 There is information about The Dying Gladiator pub, Brigg, here. I must have passed St Mary's, the university church of Oxford, hundreds of times, but this porch still calls attention to itself as loudly as it did the first time I saw it. With its curly barley-sugar columns, its scrollwork, broken pediment, and statuary, this porch of 1637 is as baroque as anything in English architecture. Built on to the side of the mainly late-medieval church, it doesn't blend in, as we are so often told that alterations to old buildings should. It sticks out. And with reason. The porch was the gift of Morgan Owen, a Welshman who had studied at Jesus College, Oxford, before eventually becoming chaplain to William Laud, Archbishop of Canterbury. Laud was famously a high churchman, with views on doctrine and ritual that took the Anglican church close to Catholicism – too close for many of his Puritan opponents, some of whom were tortured for their beliefs, some of whom left England for America. It was not surprising that a Laudian like Owen should commission a highly ornate piece of architecture such as this porch, its facade focused on a statue of the Virgin and Child above the entrance arch. Had the 17th century's violent disagreements about religion and government not escalated into Civil War a few years later, there might well have been more church buildings like this in England. As it was, the war slowed building projects down or brought them to a stop, and what came afterwards was far more restrained. So this porch, with its restlessly twisting columns, its intricate upper portion, its dramatically intercutting surfaces, and its striking play of light and shade, remains unique in England. 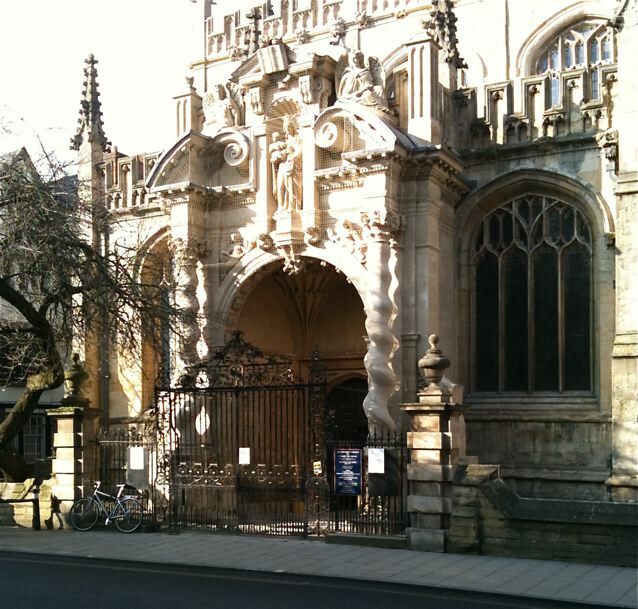 Oxford, royalist during the Civil War and with an enduring high church element in its heterodox Anglicanism, kept the porch, though, and it survives, in spite of bullet holes, made by Cromwell's troops, in the statue of the Virgin. 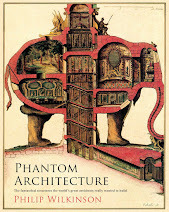 But English buildings were never quite as wholeheartedly baroque again. As my British readers will know, Spring is late here this year. There is snow in the hills around the town where I live, and the wintry weather makes journeys to explore buildings less frequent. 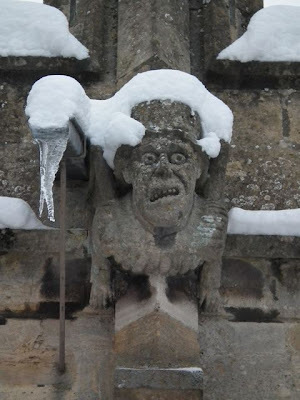 So here is a carving from my local church here in Winchcombe, which I can photograph by walking a couple of hundred yards up the road (or by standing in my garden). 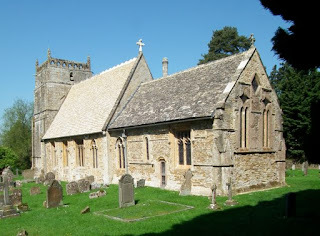 The church of St Peter, Winchcombe, was built in the 15th century, and is one of those spacious, late-Gothic buildings that on the Cotswolds are often referred to as "wool churches", because the money to build them came from the region's rich wool merchants. The origin of this church is slightly different, though, in that funds for it were provided by the local lord, Ralph Boteler, first Baron Sudeley, who had been a soldier involved in England's campaigns in France and a holder of high office at the English court. The grotesque carvings high on the outer walls of the church are among the most vigorous to have survived anywhere in England. There are various theories about their subjects, though there is little hard evidence about who they portray. Their presence on the walls of a church is testimony to the close relationship between the grotesque and the sublime in medieval art and thought – and to the sense of humour that links us to our forbears. Even after years of looking at architecture, buildings are still surprising me and pulling me up short. This little eye-catcher of a church near the A30 east of Shaftesbury is a case in point. Seen through the eye corner, the towers and battlements suggest a castle, but as soon as you look closely, it's obvious that this is a church – and one built in a very specific way to imitate a Norman cathedral on a small scale. 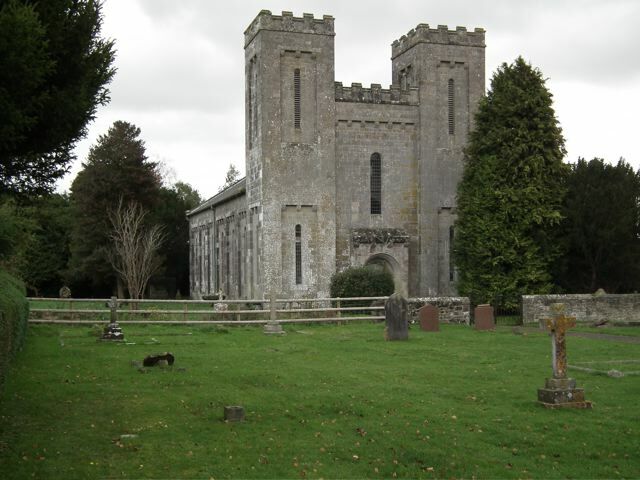 The church was built in around 1839, when a neighbouring building proved too small for a growing population. The architect, William Walker, designed it in this neo-Norman style, with round-headed doorway and tall, narrow windows, which was rather unusual in this period. I've seen it suggested that a local bigwig, a Mr Graves of nearby Charlton House, contributed a lot of the money required for the building, and maybe he had a say in the design. Whoever's idea it was, it's unusual and arresting. Small parish churches don't have two towers, do they? This one does. They usually have the entrance on the south. But this one's main doorway is at the west end. They don't normally have a west front. This one does. Neither do they usually have the rather forbidding, military-looking aspect of this building, with its very narrow windows and battlements. Even now, some time after taking the photograph, the unusual effect of this church makes me pause. "Corn exchange": a phrase that I remember puzzling me as a child. What did they do in there, swap wheat for barley? Exchange bad jokes and puns? At some point, someone put me right, and much later I came across Adrian Bell's book Corduroy, his account of leaving the literary and artistic world of London and learning to farm in Suffolk in the 1920s, with its description of farmers and merchants bargaining in the local corn exchange. A market for farmers, then (not a farmers' market), and the hub of many an English country town. 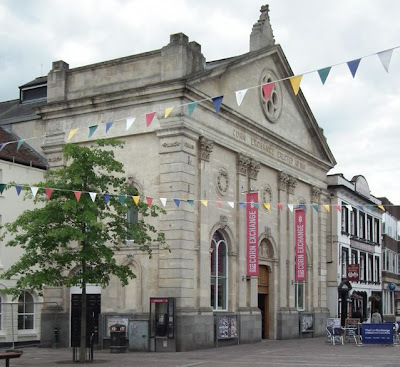 And in many of these towns, the corn exchange is still an imposing building in the centre or on the market place. This one is in the middle of Newbury and is built in Italianate style, with tall arched windows and big classical pilasters. 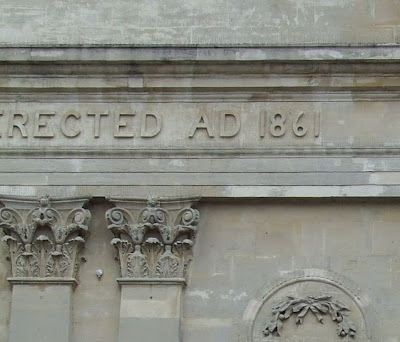 The design was by J S Dodd and the building was put up in 1861–2; it has no doubt been impressing everyone from passers-by to rookie farmers ever since. The details are quite interesting – the name of the building in thin but pleasant lettering (in what lettering experts call, with no disrespect to the form, grotesque capitals) and a roundel with a relief of a castle, its three stylized towers a version of the castle on the Newbury coat of arms. Now that farmers no longer need to gather together to haggle and sell their crops, corn exchanges need to find new uses to survive. Many have become the venues for other kinds of markets. This one is an arts centre. I'm not sure what Adrian Bell would have thought about this. Perhaps the Londoner, turned farmer, turned writer would have smiled wryly. If the name of Adrian Bell sounds familiar, it may be because of his charming books about farming and the English countryside. Corduroy is a good place to start: a gentle, beautifully observed story of the author's induction into farming life and of how he learns his profound respect for the hard work and deep knowledge of the farmer whose eye for a pig, he discovers, is "as subtle as an artist's". Its sequels are Silver Ley and The Cherry Tree. The name may also be familiar because at least two of Bell's children have made a useful mark in the world – they are the politician and journalist Martin Bell and the translator Anthea Bell (whose English versions of the Asterix books have amused generations and whose more literary translations, of books such as W G Sebald's transcendent Austerlitz, are superb). Shopfronts are not the most obvious items in the cornucopia that is the architecture of Cambridge, but here is one that pulled me up short as I walked around the town in the rain last week. My first response to this building in Market Street was a question: could this really be an original art nouveau frontage? The glorious collection of curves described by its carved woodwork certainly seemed to point that way and I guessed that it was late art nouveau, a survival from perhaps the early 1920s. When I got home and looked it up, I found that the building's official listing put it at c 1910, whereas Kathryn A Morrison in her excellent English Shops and Shopping dates it to c 1923, when the front was made for Stetchworth Dairies. The front repays a close look. The woodwork above the door is a stunning collection of stylized foliage and multiple curves that turn back on themselves in a way that we're now more used to seeing in Paris or Brussels than in England and the flowers and stems in the glass echo these curves beautifully. 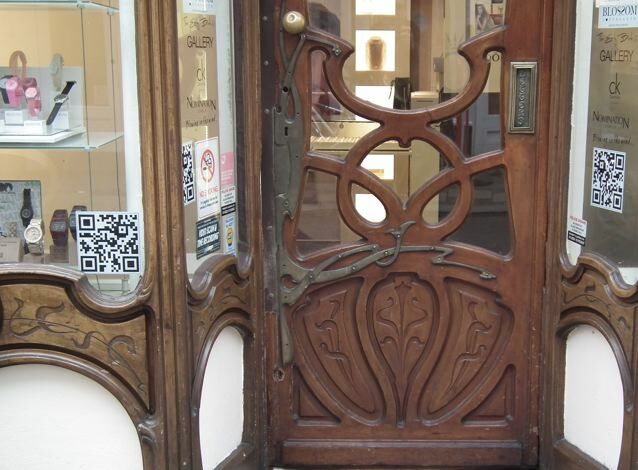 The door and the wooden panels on either side take up the theme of curves too, as does the extraordinary metalwork. The building must have made a remarkable diary. The front seems to have been designed to catch the eye more effectively than the display of eggs, cream, butter, and cheese in the window. If it's not perhaps as effective in its new role fronting a gift shop (it seems to cry out for a more sensitive sign than the one currently in place), at least it is in use, a curvaceous and exotic reminder of the skill with which which shops were designed and fitted out in the days when frontages like this were made to last. Allen, 1st Earl Bathurst (1684–1775) was part of the circle at the heart of English high culture in the 18th century. He was a friend of the poet Alexander Pope, and the fact that one of Pope's celebrated poems is the Epistle to Bathurst has ensured him a place in the history of poetry. One thing that helped cement the friendship of Pope and Bathurst was an interest in gardening and the layout of country parks. Next to his house in Cirencester, Bathurst laid out a remarkable park – the first park in which long straight rides extend through trees, crossing at rond points like the directional lines engraved on old maps and charts. The whole thing goes on for miles, with the ranks of mature trees stretching into the distance and the rides leading to distant vistas – the central ride aligns perfectly with the tall medieval tower of Cirencester parish church. The current Earl Bathurst keeps this extraordinary place open to the public, so that walkers and horse riders can enjoy the landscape. Dotted here and there are interesting structures – a lodge with a round tower, a monument to Queen Anne with the monarch's statue atop a tall column, a hexagonal pavilion, and this tiny classical building, Pope's seat. Pope's seat is at first glance a fairly standard bit of Georgian classicism with pediment, niches, and urns. But just as Pope's poetry, apparently so demure in its couplets, can leave seemliness and predictability far behind, so this little building bucks the trend somewhat. Those rusticated stones breaking into the bottom of the pediment; the irregular urns; the rather jazzy banded masonry all make this building stand out. 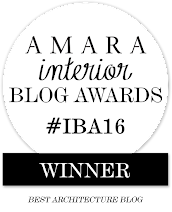 It was just the thing to give shelter to a poet who wanted to rest and admire the view. Just the thing for us too. 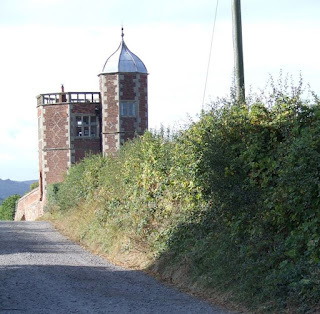 Rounding a bend in a lane in Shropshire, I caught a sudden glance of a small pointed roof and stopped to find this little tower, apparently stranded on its own next to a tall garden wall. It is stranded because it is the last remaining fragment of Eyton Hall, the home of Shropshire grandee Sir Francis Newport, who rebuilt his house in the 1590s and early 1600s. The tower was one of a pair, standing at either end of a bowling green, and its artful plan (based on two conjoined octagons), diaper-patterned masonry, and ogee-capped roof are typical of the more ornate style of English architecture at the end of the Elizabethan period. The building was what was known as a banqueting house. The tradition was for those enjoying a grand meal to take the last course – fruit, comfits, dessert wine – in a garden pavilion or tower, where they could enjoy a view across the garden. It was perhaps the closest they got to al fresco eating, an architectural concession to the English climate akin to Elizabethan long galleries, which enabled Tudor and Jacobean ladies to enjoy a walk without going outside to face the elements. 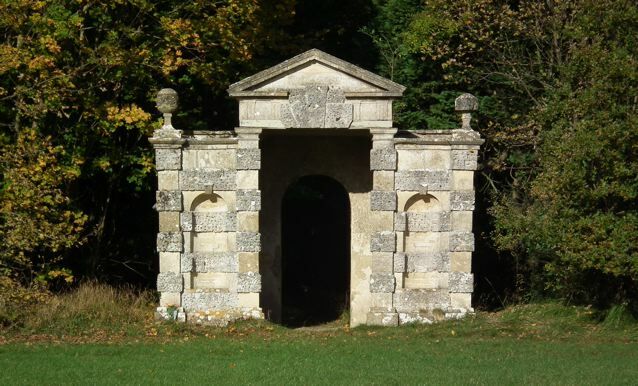 Some of the grandest of country houses, such as Longleat, had banqueting houses in the form of towers on the roof, but pavilions like this one at Eyton did the job just as well, while also maintaining a closer connection with the garden. It's possible to enjoy this little tower not merely as I did, as a passer-by, but more intimately. It is in the care of the Vivat Trust, who let it out as a holiday home. 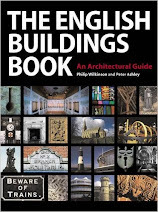 The details, together with more historical information about the building and its history, are here. After all the recent posts about timber framing, a contrast and a little light relief. A while back I did a short series of posts about stick-on signs on shop windows. 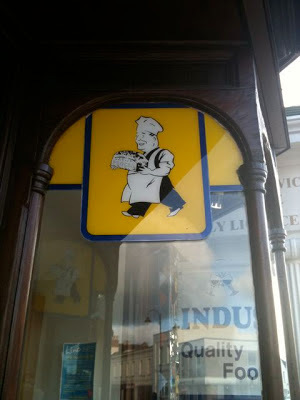 One of these posts showed a sticker in Bromyard for Procea bread, and around the side of the window, only just visible in my photograph, was another Procea sticker showing a character, called the Bakerman, that the company used in their advertising. One reader asked to see more of the Bakerman, but I did not have a more revealing image from the Bromyard shop. Yesterday however, looking on my phone for something else, I remembered that I'd taken this photograph on the way to breakfast (a rare but cherished treat, the full English) in Cheltenham. So here is the loaf-bearing Bakerman, standing out against the yellow background that Procea used to catch the eye. Short he may be, but his loaf is large. Can the Bakerman really have been here since the 1970s, when the brand was bought by Spillers? If so, his survival is a bit of good fortune, although not as accidental perhaps as the collection of reflections in my rapid-fire photograph – a little of Cheltenham's Regency architecture, plus a 1960s block abutting it (itself an architectural leftover from the heyday of Procea), a curvaceous street lamp, and the other Procea sign on the opposite side of the doorway. All caught in a moment as my mind was briefly distracted from thoughts of bacon, egg, mushrooms, and toast.